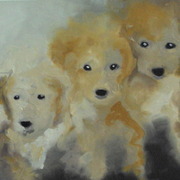 Our sweet neighbor, Joy Malin, is an artist who most recently has discovered her amazing talent for animal portraits. We’ve seen her over the years, taking canvases of gorgeous florals or figures in and out of the building, sending off her masterpieces in the back of her clients’ cars, conducting art classes in the park and in her apartment. 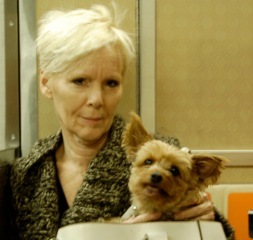 We mostly see her walking her amazing little guy, Charlies, the cutest little Yorkie you’d ever want to meet, around Tompkins Square Park. Joy and Charlie always have an ebullient hello for Mignon. human children, too! ), Charlie, is with her practically everywhere she goes. Most of you know how much FashionWhirled adores its doggie friends and to have them intersect with art, well, it’s almost too much! 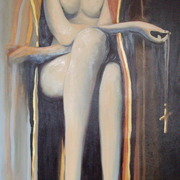 Here, a little Friday:5ive visit with the lovely artist Joy Malin. FashionWhirled: What role does style, or fashion, play in your life as an artist? How does your personal style inspire the style of your animal portraits? Joy Malin: I’m a very simple-looking girl from the outside. I’m always in black, an old gallery trick, making the art the most important thing in the room. It is another thing when you walk in my apartment. Lots of color, lots of fabric layering and not one more inch for another painting! I like pretty! I hope my animal portraits all have a little pinch of humor. FW: What made you first realize you wanted to be an artist? When did animal portraits come into that equation? JM: The first memory I have of really falling in love with life was walking through a museum somewhere in Europe. Holding on to my grandmother’s hand, feeling the cool marble floor and seeing the most beautiful things in the world surrounding us. 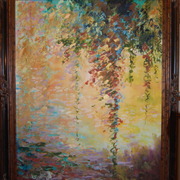 I was lucky to have a grandmother who loved art, and me! My visits to Geneva to see her and traveling around Europe were all too few and far between. But they were enough to light that fire within me, I knew who I was and what I really loved. 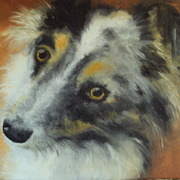 Animal portraits were always in the equation, I think most of the incarnations I have had have been to experience life as a dog! FW: Who is the muse or inspiration for your art? Do you see your animal portraits as fashionable accessories to a fashionable home? Why yes or not? 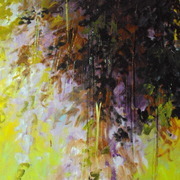 JM: The inspiration comes from nature, light and shadow, beautiful color, something that sings “mother earth”. My muse is every wonderful dog I have ever known. The unconditional love I am now experiencing from my dog Charlie shows me what love is. Now that you mention it, I guess I do see my animal portraits as part of a fashionable home. Without heart, how fashionable can a home be? FW: If you could have any notable individual — animal or human, dead or alive — sit for one of your portraits, who would that be and why? JM: My grandmother, I wish I could thank her again. Cleopatra, beauty, brains and a great wardrobe! FW: What words of wisdom do you live by, or strive to live by? What legacy do you hope to leave to the future?! JM: Smile, you’re forgiven! My legacy, my children. Don’t tell me you don’t meet great people while walking your dog in this city. For several years I’ve admired this one gentleman and his tiny Yorkie who live in the ‘hood and play in the park in front of my place. Sometimes he has his head shaved, showing off his intricate scalp tats, sometimes he’s got the coolest striped shorts or military-style jacket on, always he has his little one prancing, so well behaved off leash, next to him or cuddled securely in his arm. designer and former LES retail shop owner. During the tenure of his Ludlow Street design boutique, Body Worship, Andy was no stranger to the world of high-rolling fashion, major celebrity and a unique design sensibility, brought into relief no doubt from his Indian heritage. I adored hearing about his new projects and their progress, related in his very cool slight accent. Recently, he’s been testing the waters with a jewelry collection that’s now selling at Anthropology (more on that later) and an organic gourmet product line, Steve and Andy’s, that he launched earlier this year with his partner, Steve Marino, a makeup artist. Steve and Andy’s at my place, ready to be eaten! Steve and Andy’s Candied Orange Peels and Steve and Andy’s Orange Marmalade is the love child of their collaboration in the kitchen, using only organic ingredients and a special process of sugar coating dried orange peels for the candy and the fruit for the marmalade. It’s USA-made and leaves no waste, according to the founders, who are establishing an organic kitchen just outside of the city. Steve and Andy’s has been featured at the Tribeca Film Festival and in celebrity green rooms (former clients per Andy and his LES shop: Britney to Madonna to Steven Tyler and beyond). The product is available at Dean & Deluca, and getting ready to drop at popular organic food outlets in the near future. I’ve tried both the peels and the marmalade, and if you are searching for a sweet and somewhat spicy-infused orange treat that’s nutritious and a healthy alternative to candy, you will love this organic delectable. This week, Fashion Whirled welcomes Arjan Khiani and his latest couture confections, Steve and Andy’s, to Friday:5ive. FashionWhirled: What role does fashion play in your everyday life and how does what you’ve done in the past, career-wise, translate into what you’re doing now with Steve and Andy’s gourmet products? Arjan Andy Khiani: Style creates fashion. That said, it is very important for me to tap into that creative force as often as I can and when you are able to touch that part of your soul is when magic happens. It is exactly the same philosophy that I use whether I am designing clothes, jewelry or food. You see, you can’t really think too much about what it is you want to do or how you do it…you really only do it when you give yourself a choice. Steve & Andy’s gourmet products are an experiment on how we can have fun with all the exotic ingredients life has to offer! FW: Who is your muse and what importance does he/she play in your business life and in your personal life? AK: My Soul. I al(ways) listen to it. It is that almighty voice that has helped me make all the decisions in my personal and business life for 26 years now. No regrets and still having fun!!! FW: If you could have any notable person, dead or alive, collaborate with you on a daily basis, either from a fashion standpoint or in general, who would it be and why? 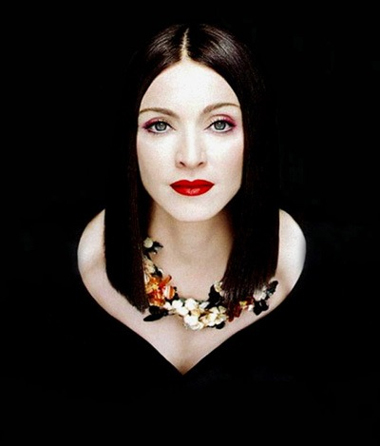 AK: Madonna. Here is one woman who knows Creation. FW: What is your most revered, favorite piece of clothing that you either own now or previously owned and why do you place importance on it? AK: I am a very specific shopper… Comme des Garcon, Yohji Yamamoto, Vivienne Westwood. I treasure all of their pieces. In all their quirkiness they are able to translate the essence of design. FW: What words of wisdom do you live by and in what way have they affected your life? AK: Listen to yourself and you will receive all the answers.